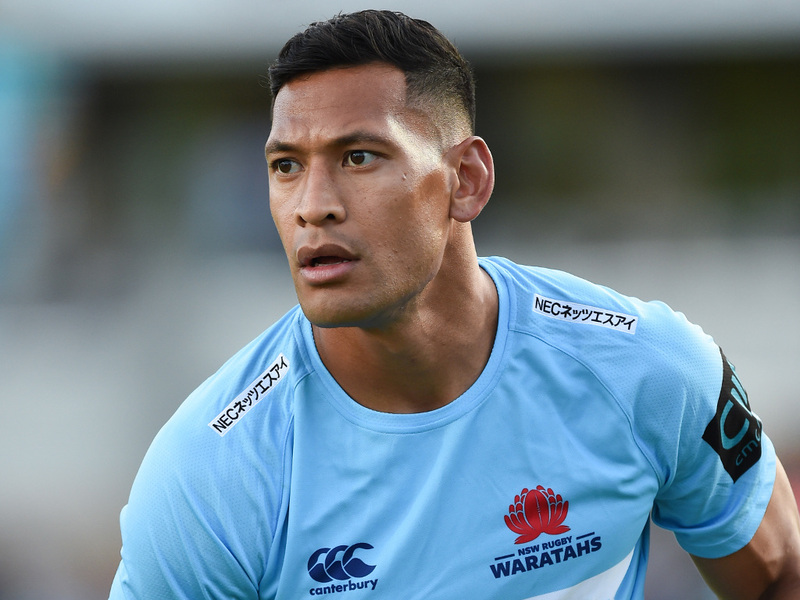 Israel Folau hit the headlines for the wrong reasons again this week and his latest social media gaffe shows that he has finally overplayed his hand. Folau’s Instagram post, done in the name of his religious beliefs, was issued as a “warning” where he said “hell awaits” a group including “homosexuals”, “drunks”, “adulterers”, “liars”, “fornicators”, “thieves”, “atheists” and “idolators”. He also tweeted the same message but included a news bulletin about Tasmania becoming the first state or territory in Australia to make the inclusion of gender optional on birth certificates. Those outbursts sparked public outrage and led to him being called in by Rugby Australia at the time to explain himself, but the governing body opted not to sanction him after Folau expressed that he was merely expressing his Christian beliefs. Rugby Australia seemed to dance to his tune then because he is their most high profile player and seen as a key component in Australia’s bid to win the Rugby World Cup in Japan later this year. The Wallabies and Waratahs star is a wonderful sportsman and a superb athlete, who will go down as one of the greats of rugby union. Just last week, the 30-year-old became the leading try-scorer in Super Rugby history and the talented utility back has also represented his country with distinction in 73 Tests. His prowess is not just restricted to the 15-man code, however, as he also had a stellar career in rugby league. In fact, Folau is one of only four players – along with Brad Thorn, Sonny Bill Williams and Peter Ryan – in history to win a Super Rugby and NRL title, after securing championships with the Waratahs and Melbourne Storm respectively. And sandwiched between his switch from the one rugby code to the other is a two-year stint as an Australian rules football player as well. With a distinguished record like that, it is understandable that he should have plenty of bargaining power when negotiating contracts and even though Rugby Australia told him last year to stop posting his controversial views on social media, he continued to do so. It could be that he had it in the back of his mind that if he does do it again and they sack him – which is set to happen now – he could always leave rugby union and resume his career in the NRL. But that’s not going to happen as the NRL have revealed they are not interested in acquiring his services because of his controversial views and now he’s fighting to save his career. Folau’s behaviour – after his latest social media posts – shows that he did not think much of his employers as he ignored phone calls from Rugby Australia officials for more than 24 hours after Wednesday’s outburst. According to Australian media reports, Folau only decided to contact Rugby Australia CEO Raelene Castle when he realised the seriousness of the situation after the governing body informed his manager that they were planning to terminate the cross-code star’s contract. That, and possibly the realisation that he’s not wanted in the NRL, led to Folau contacting Castle, who he met along with other Rugby Australia officials in Sydney on Friday where they informed him that they will continue with their decision to sack him. Folau has now requested a code of conduct hearing as he intends to fight to save his career in Australian rugby. There have been rumours of a possible move to a Top 14 outfit but that is also unlikely to happen as clubs would not be keen on the negative publicity which Folau would bring. In fact, Toulon owner Mourad Boudjellal, who is renowned for signing big name Test stars, has already rejected the possibility of signing Folau by saying: “The guy is a moron, he must leave. Or you have to buy a brain,” in an interview with L’Equipe. Folau’s now lost his bargaining power and by overplaying his hand, it looks like his glittering career is in tatters.